Harare - President Emmerson Mnangagwa has with immediate effect suspended University of Zimbabwe Vice Chancellor, Professor Levi Nyagura pending the finalisation of his alleged charges of criminal abuse of office. In a letter from to Higher Education Minister, Professor Amon Murwira, Chief Secretary to the President Dr Misheck Sibanda said. “Please be advised that His Excellency the President of the Republic of Zimabwe and Chancellor of the University of Zimbabwe, being the appointing authority in terms of section 8 of the University of Zimbabwe Act. According to Sibanda, Nyagura’s suspension is in terms of Section 340, (1) (f) of the Constitution of Zimbabwe, read together with Section 28 of the interpretation Act (Chapter 1:01). 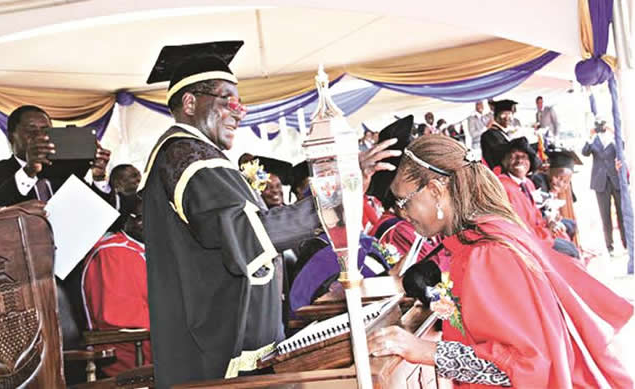 Nyagura who will continue to receive his full benefits, has been in the eye of a storm over allegations that he facilitated the conferment of a Doctor of Philosophy degree on former First Lady Grace Mugabe. His trial which was expected to kick off yesterday could not proceed after his lawyers pleaded for more time to prepare his defence. Nyagura had initially notified the court of his intention to apply for refusal of further remand before he was given yesterday as date for the commencement of trial. He will be back in court for trial on the 5th of September.